W.H. Wonnell is one of few men still working in the huge shop where Pennsylvania Railroad's steam engines were repaired. The panhandle shop, still the second largest in the entire Pennsylvania Railroad system, is just a shadow of its once robust self. Much of the hustle and bustle, a lot of the color and hundreds of employees, went with the snorting, puffing, smoke-belching steam locomotive. Progress - and diesels - have changed the picture. 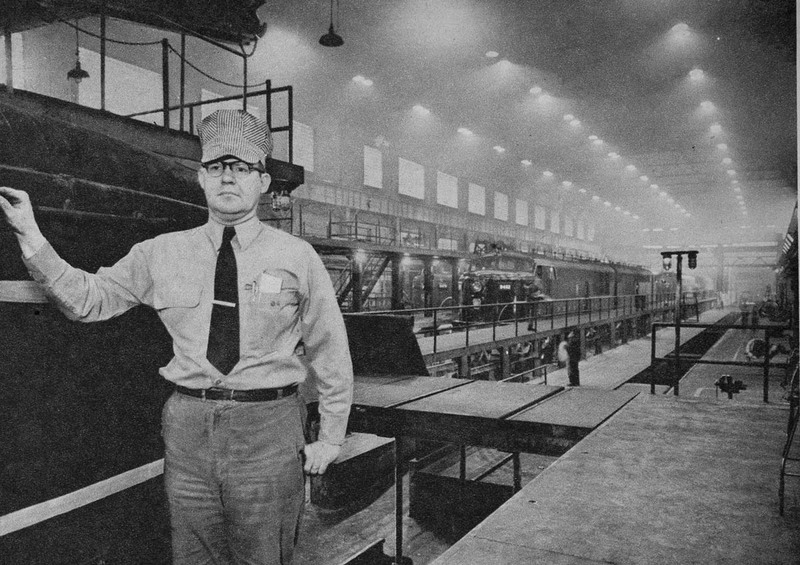 Once, just after World War I, the Twentieth Street locomotive and car repair facilities had 8000 employees. The force ranged up to 4500 during the last war and stood at 3300 as late as 1951. In 1953, shortly before the first mass layoffs were ordered, the employment force had dwindled to 2800. Now, there are 178 workers in the car repair division, 1186 on engines - a total of 1364. 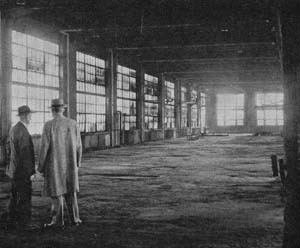 Pennsylvania Railroad's Panhandle shop in Columbus now has 160,000 square feet of floor space vacant as result of switch to diesel power. Within the last year 19 wooden structures and the Spruce Street roundhouse containing 173,000 square feet of floor space, have been torn down. Some 160,000 square feet of additional space in brick buildings stands idle. Departments have been merged and combined. "You just can't stand in the way of progress," commented one observer. So you bump into a boilermaker in the shop and he'll have 30 years or more employment seniority. One in the engine house will have 15 years seniority. A machinist must have 26 years seniority to hold most jobs in the locomotive shop. A blacksmith - and there are only five currently at work in a department which once employed 280 - must have more than 22 years seniority. The change to diesels effected one other major change. It increased the demand for electricians. The "youngest" man in this classification has only about four years of Pennsy employment back of him. "Steam locomotives are not useless, they're only outdated by diesel developments," insists E.C. Hanly, master mechanic in charge of the Columbus shops of the Pennsylvania Railroad. So 189 of the monsters are stored on yard tracks near the shops. They will be used in case of emergency. Pennsy used 36 steam locomotives to take care of local switching, and to make runs to Logansport, Indianapolis and Sandusky during the Christmas rush. The number currently in use is down to 15. The Pennsylvania planing mill once supplied all the lumber needs of the entire section. Now the building stands empty. Tank and paint shops are idle, the pipe shop has been moved in with the electricians and the old steam locomotive overhaul shop has become the diesel engine shop. Six departments, which once boasted some 2000 employees, have become the machine shop, with 87 on the payroll. Foreman H.O. Waechter, a Pennsy employee almost 49 years, is direct supervisor of activities formerly contained in machine shop, fit-up, boiler, tank, blacksmith, and car machine departments. Two factors are principally "blamed" or "credited" for the labor economies. 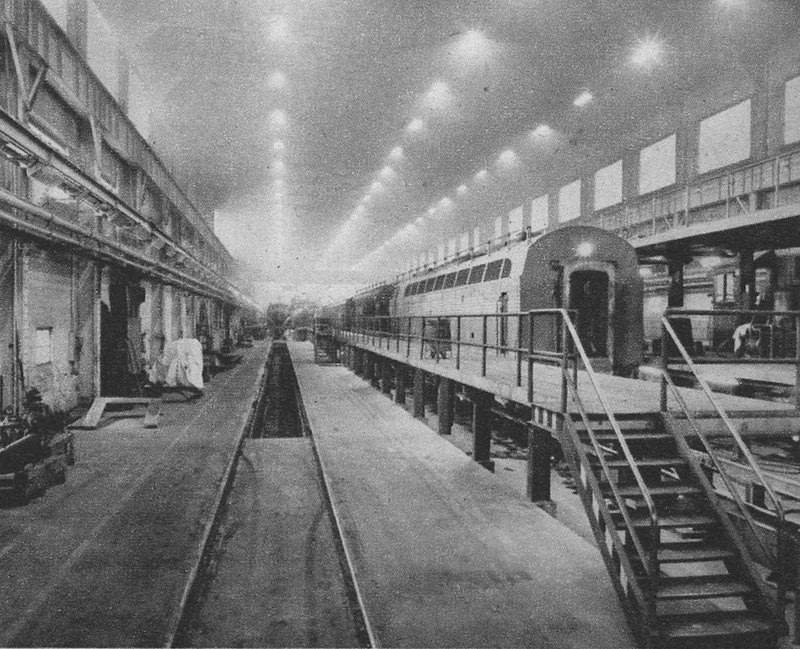 Better equipment meant fewer repair orders to both car and locomotive divisions. The advent of diesels brought uniformity of parts. The latter factor is the big one. Previously, giant departments were needed for virtually manufacturing parts to replace worn or damaged ones. 1903 photograph of Columbus erecting shop shows locomotives in various stages of assembly. Plant once employed 8000 men. General foreman H.U. 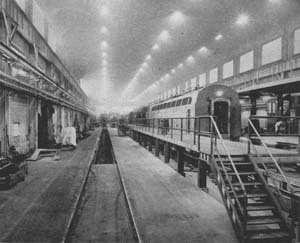 Bates estimates that perhaps 70 per cent of the total work force once was busy "making" steam locomotive parts; only 30 per cent were employed in the direct work of removing, replacing and servicing the parts. Diesels also pull a heavier load than the old steam locomotives, so fewer engines are required. Diesels made their advent on the road in 1945 and the diesel shop was opened here in 1949. 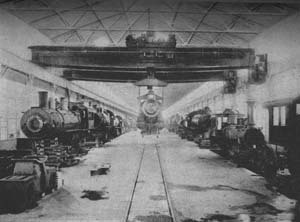 On January 12, 1954, old 6498 became the last steam locomotive to leave the erecting shop. This department employed as many as 700 a few years ago; diesel operations require only 278. Freight and passenger car repairs are restricted to jobs requiring less than 20 man-hours of work. So the big jobs go on to the Altoona, Pennsylvania, shops. 1955 photograph shows old erecting shop as it appears today. Building is now used as maintenance center for diesel engines. The Panhandle shop - officially the Columbus shop - was built in 1886 to supply locomotive and car parts to the entire western region of the system, extending as far west as St. Louis and Chicago. It was enlarged in 1902, 1919 and 1944. Now the clatter is muffled, the hum of machinery negligible. But the work goes on and Pennsy stock keeps rolling as efficiently as ever. The 1364 employees are scattered through two-score buildings, 73 acres of shop yard and over 540,000 square feet of production space. To a casual observer, remembering the feverish activity of former years, the place seems practically deserted. Employees who had to be laid off were a matter of concern until officials checked and determined that 85 per cent of them have obtained as good or better jobs in industry. The other 15 per cent presumably are like the blacksmith who wrote he had almost 30 years service, is in his 50's and can't even hold a laborer's job. Even he is not bitter. "I'm not worried. Something will turn up," he insists. "Besides, no one can stand in the way of progress." "Dead" steam locomotives in Pennsylvania yards now number 189. They are being kept for use in case of emergency, as they are still serviceable.